Some comics you might enjoy. 1. T-Rex learns about calorie counting. Heh. That Indexed is hanging on my wall. That site is so smart. I love it. 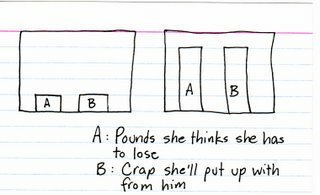 I’ve always called A ‘how much better she thinks she can do’. Holls: but wouldn’t “how much better she thinks she can do” have a negative correlation with “crap she’ll put up with from him” rather than the positive correlation shown here? Dinosaur Comics FTW! Such thought put into 90s clip art. I’d like to point out, though, because I am a giant nerd, that technically, a calorie is the amount of energy required to heat one GRAM of water up by 1 degree celsius. A food calorie is a kilocalorie or a Calorie, and it’s 1000 calories, therefore 1 kg of water. 2000 kilocalories a day just sounds waaaaay scarier, because it’s TWO! MILLION! CALORIES! I am now telling anyone who asks me if I know what I’m eating that it doesn’t matter, because I aim, every day, for TWO! MILLION! CALORIES! Erin, Ryan North talks about that problem on LJ! Dude, I never knew that thát’s what a calorie was. I love the T-rex! I want to take the T-rex home! I have zero tolerance policy for crap from boyfriends, and it has served me well. How much better she DOESN’T think she can do. SO many awesome women beat themselves up about so many things. Might I suggest to anyone who clicks on the cute graph posted here: Don’t read the comments. Some morons thought they’d be “helpful” by explaining to the artist how EASY it is to lose weight. I’m so glad he explained it. I never would have figured it out with my aching woman-brain. Too busy thinking about expensive shoes and ways to avoid exercise. @ Liza: that one just filled me with warm fuzzies. Should the right hand graph ALWAYS be the goal. wow… sorry, I obviously brought the troll to Indexed, since that comic hadn’t been commented on since 2008! I LOVE the T-Rex. That just makes me giggle. It’s about EIGHT POINT FOUR! MILLION! JOULES!, but it doesn’t sound as nice in metric. Boo. I second TWO! MILLION! CALORIES! O concur that the indexed one is sad, there is such a sad feeling to it. I Blame The Patriarchy! Hee! I love the T-Rex! ^ aw man, you wrecked the suspense!! I could actually hear the 50s horror movie screams behind it on the soundtrack in my head. Apparently that’s what I consider normal cause I didn’t really notice anything odd, til I went back up to copy the spoiler alert and heard them again! Which did actually make me laugh out loud. if you can’t laugh at your own psychotic symptoms, what can you laugh at?? Heee, Lily. That was excellent.